Grey has become the UK’s favourite new car colour for the first time since records began, now accounting for one in five purchases. Figures from the Society of Motor Manufacturers and Traders (SMMT) show that grey has knocked black off the top spot, with 495,127 grey new cars sold last year. 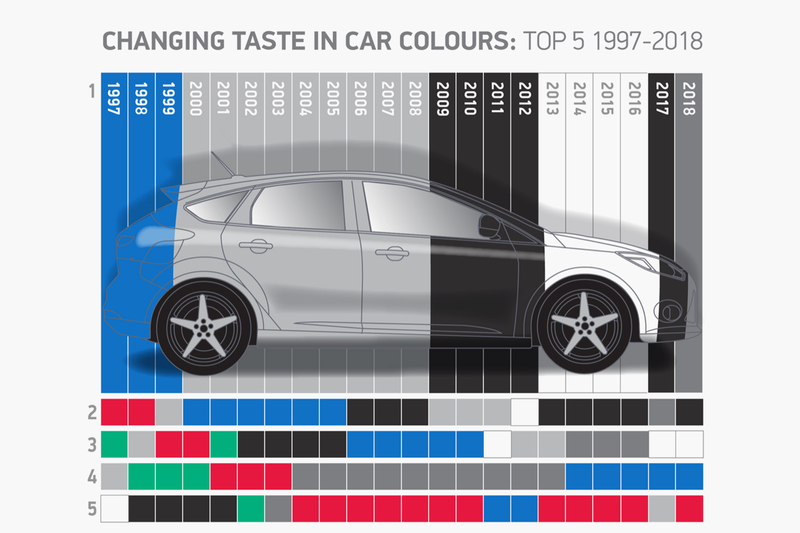 British buyers’ preference for dull colours continues: the top three colours were grey, black and white, which together accounted for 59% of car sales. A primary colour hasn't been in the top three since 2010, although blue and red currently sit in fourth and fifth place respectively. Silver, which was the most popular colour between 2000 and 2008, has now fallen out the top five to sit in sixth position. Cream experienced the biggest year-on-year drop in 2018, of 34%, with just 559 customers opting for the colour. Of the top ten most popular models last year, the top three – the Ford Fiesta, Volkswagen Golf and Vauxhall Corsa – were all sold most commonly in grey. The only model in the top 10 that wasn’t preferred in grey, black or white was the Ford Focus, with its most popular colour being blue. Scottish customers bucked the national trend, preferring white over any other colour, but those in Northern Ireland and Wales favoured grey. Of the 118 colours available, English drivers registered 116 of them, while Northern Irish consumers ordered only 53. Is it really what customers prefer or down to the price charged for grey vs red? When we bought our Mini yellow and white were free other colours were about 1500 if memory serves right! We went yellow on a Mini Cooper. TStag has some of it - price, but there is also the options offered to customers. If the manufacturer's paint choice for a single vehicle is several shades of grey, blue, black, white, which colour will be the most common ? I find the colours offered by many makers: black, white, and multiple shades of tarmac to be very boring. Yep, so many cars are just not offered in brighter colours. Dull, duller or dullest, i.e. grey are often the only options. "Of the 118 colours available, English drivers registered 116 of them"
And you don't name the 2 they didn't register! What is the difference betweem grey and silver. My car is silver, although most of the time it is grey with road grime! ... Solid red had long been one of the flat colours available at a cheaper price, however the introduction of a solid flat grey such as the Urano grey as the only non-chargeable colour in the VW range on Golf, Polo etc will have skewed this a bit, and several other flat Greys have become available on other ranges. Also Orange at number 7 ?!? Despite being the name of the company I work for I still don't think I see anywhere near that number of Orange cars on the road and it isn't available on volume selling models in a lot of manufacturer ranges, cetrainly not many of the top 10 best sellers offer it on high volume specifications like SE or Zetec, so where's it coming from? As already said, the choice of colours is either very narrow, with half a dozen shades of grey predominating, or it punishes those who actually want something a bit lively. Ergo, dull colours win out. I would have thought that there are quite enough cars about with stealth colours for anyone to be willingly buying any more. It is almost axiomatic that any car with no lights on in poor light conditions will be black or a very dark grey. I suppose that is the statistical likelihood but it does make the dullards stand out if you'll pardon the contradiction in terms. I agree that it is mainly the manufacturers fault, offering dismal colours that results in 50 shades of grey being the default choice. Now, if the government put a tax of say £500 per car on grey, black and white and a tax rebate on red, blue, green and yellow; wouldn't the country be a brighter place!! !